By Greg Campbell Posted: March 21, 2019 5:55 a.m. The University of Regina is launching a new anti-discrimination campaign. The campaign, “You Belong Here. 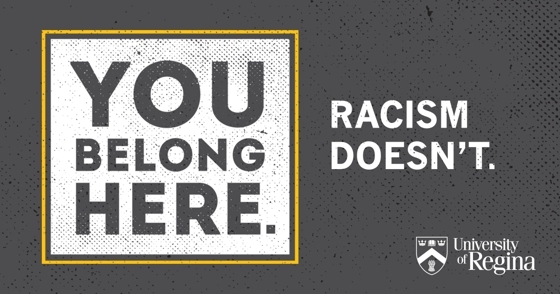 Racism Doesn’t.” reinforces the message that the University is a welcoming institution that is open to all. It also raises awareness of the behaviours and attitudes – such as bullying, abuse, harassment and discrimination – that are not acceptable on the University’s campuses. The launch of the campaign on March 21, coincides with the United Nations International Day for the Elimination of Racial Discrimination. Police-reported hate crimes have risen steadily in Canada in recent years. Between 2014 and 2017, incidents of hate crimes based on race or ethnicity rose by more than 30 per cent. In a 2016 Statistics Canada report ranking the highest per capita police-reported hate crimes, Regina placed 11th on a list of 33 Canadian cities. This initiative complements the University’s recently launched UR Respect, an interactive eLearning tool developed by Respect Group Inc., co-founded by child advocate Sheldon Kennedy. The program delivers online training programs aimed at preventing unacceptable behaviours in sports, education and the workplace.